Okay, I’m spoiled with an extraordinary local library, Glen Carbon Centennial Library. Even Bill Gates agrees awarding my hometown library the Best Small Library in America Award in 2010, so I’m not kidding when I write I’m spoiled. Yet, I always like to seek out libraries in a town or city I may be visiting to observe their local offerings. Today, I was able to mark Bethalto Public Library off of my list of library adventures. 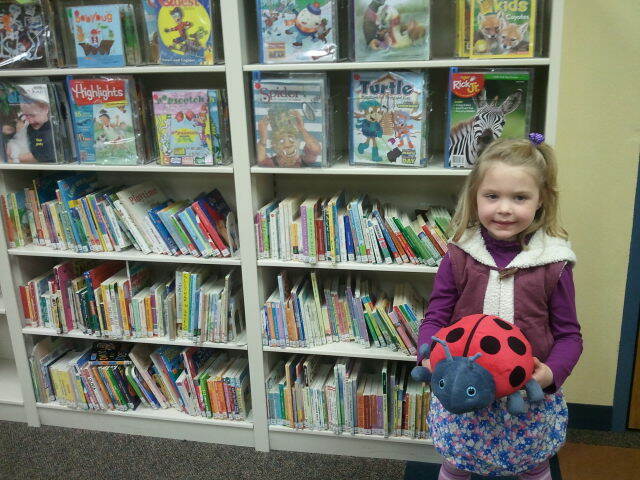 My oldest squirt had a birthday party to attend at the local bowling alley, so my youngest squirt and myself decided to use this time wisely at the public library in Bethalto, IL. Up the stairs and immediately to the left we discovered the children’s section filled with stuffed animals of all shapes and sizes for which visiting squirts may play and read with. A vast offering of videos, picture books, children’s magazines, and leftover storytime crafts were available for use. What sealed the deal for my daughter, though, was the just-her-size shopping cart which we were able to fill to the brim with not only her selections, but also mine (yes, I am finally out of my reading slump with Beth M. Howard’s Making Piece: A Memoir of Loss, Love and Pie). So, be sure and check out your local library. You can’t beat free reads, and if you’re in the Illinois Heartland System as both Glen Carbon Centennial and Bethalto Public Libraries are, you may check books out and return them at either location. No fines for me!